People who are differently-abled are often pushed to the outskirts of society. At EDGE Theatre's Constellation Project, we fight that by creating an all-inclusive community around art. By casting projects highlighting people who are differently abled with their peers who are typically functioning side by side, sharing equal status, we reflect the world we want to live in. For over a decade, we have been using musical theatre to bridge a social gap. For the past two years, we've added classical theatre like Shakespeare and Wilde to our repertoire. We desire to add a third component with a professional short film experience. We picked Star Wars for many reasons. Our Artistic Director Orion Couling is very involved in the Geek Community here in Chicago. As a certified stage combat instructor, he has taught lightsaber at the Adler Planetarium, Milwaukee Discovery World, and at a multitude of conventions and workshops around the world. EDGE Theatre has also produced a Star Wars Shakespeare mash-up with Macbeth called MacSith and toured it for education after a massively successful local run. We have also produced the Klingon Christmas Carol here in Chicago for the past three years. Moving to film that emphasizes our mission seemed to be a logical choice. As educators and community members of the Geek community, we are sickened and outraged by the hostility towards people of color, women, and people who are not traditional "heroes" expressed by a large segment of the Star Wars fan base. We firmly believe we all need a seat at the creative table and this film offers a chance to challenge that narrative with a decisive action based story. As far as we know, this will be the first time the main action heroes of a Star Wars fan film have been actors with Down Syndrome. Our supporting cast features diversity and strong female characters. It's nothing short of revolutionary. We invite you to join the Inclusion Revolution! The First Order continues to rule the galaxy with an iron will. The Resistance, broken and splintered, holds on to the last pieces of hope. Yet on a far off moon of the galaxy, hope lives among the people in a small colony. This small colony escaped from the strict rules and ways of being to create a new home that welcomes all people of all abilities. They are resilient, they are strong, and they are no easy targets. We have three levels of goals. This includes a small professional team of filmmakers being led by Scott Potter with Hidden Catalyst productions, a stipend for our cast, costuming, standard special effects, and scoring. It also allows budget for submitting to festivals and conventions. We blaze the screen with animation and 3d modeling. Spaceships soar and explosions light up our film. With this budget, we can realize our full creative power. And finally, a victory lap! If we exceed this funding, we will use the leftover amount to create another film next year. Anything over $20,650.00 will be given to the Seed Foundation from Niles Township District for Special Education. The force is strong with us! Join us and help us take our fandom back from hate and prejudice and give it to ALL of us. Check out this cool behind the scenes look written by our own Director of Photography, Scott Potter! For the next week, thanks to an anonymous donor, every donation you make to EASY TARGET will be matched dollar for dollar, up to $1,000! What does this mean? If you give $25 to EASY TARGET within the next seven days, your $25 gift becomes $50!! Or your $50 gift becomes $100!! Please double the impact of your donation to The Constellation Project and Edge Theater between now and November 13! Thank you so much for your kindness and support! If you haven't seen our trailer, it's sweeping the internet! 8000 views and counting! When the galaxy needs heroes, chromosomes don't count. We believe that Star Wars is the perfect universe to build our first short film in after spending a decade working with differently abled actors. 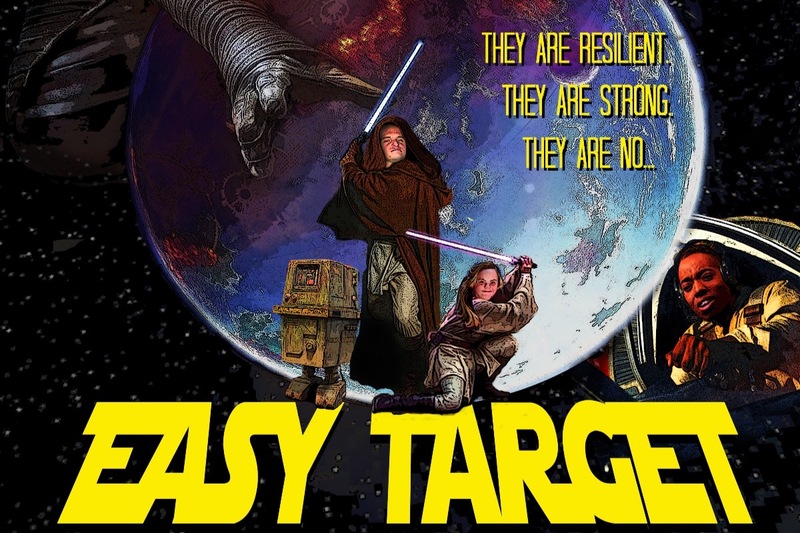 This teaser is just a glimpse of what is to come in Easy Target: A Star Wars Fan Film. Check out this promo video about Easy Target!